Colt's Neck, New Jersey is the headquarter for Norvinz, that relatively new collaborative effort between Gingko Audio's Vinh Vu and his partner Norman Ginsburg. Not content to restrict their efforts to custom acrylic dust covers for turntables, equipment racks, isolation devices or even their own speaker, the Tubulous One, Vinh and Norman are branching out into importation and distribution. When I visited Vinh's home last March, I listened to a system set up in his home and was mightily impressed. Norvinz had just worked out a deal with Opera Audio's new US importer -- Joe Trelli of UltraViolet Audio -- whereby Norvinz would be handling exclusive distribution of Opera's Cyber mono amps. Though I'd already had the Cyber 300B PSE amplifiers through my home for a preliminary matchup with my own gear, after hearing Vinh's system below, I put forth a plea to try in my own room instead the 211 amplifiers I'd heard during my visit. What became a two-part plea, I also requested to borrow his Lamhorn 1.8s, a speaker about which Mike Lavorgna had already written in May of 2006. While the reader arrived at this page to read about amplifiers, not speakers, I feel compelled to weigh in on the Lamhorn 1.8s nonetheless. My detour isn't completely without merit because, as it happens, the Lamhorns were the perfect speakers for the Cyber 211s. A brief introduction here then probably won't be construed as wasted time. If you disagree, just scroll down to the formal discussion on the Cyber 211s. But while you're here, I'd urge you take a few moments and get acquainted with the Lamhorns. First, the AER-equipped Lamhorn 1.8 is, without a doubt, one of the two most exciting products I've had in my home in the last year, perhaps ever. 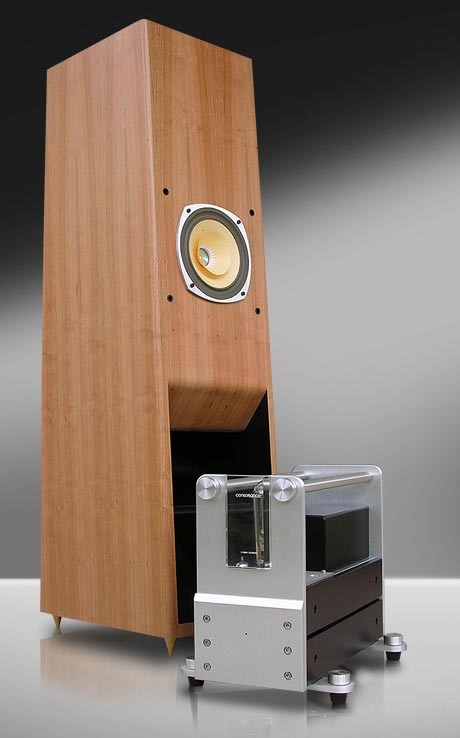 The Tidal Piano loudspeaker redefined for me what a conventionally designed loudspeaker can do. At over twice the price of the Lamhorns, it has sweet treble extension out the wazoo and bass depth and power that will for all eternity elude the Lamhorns. 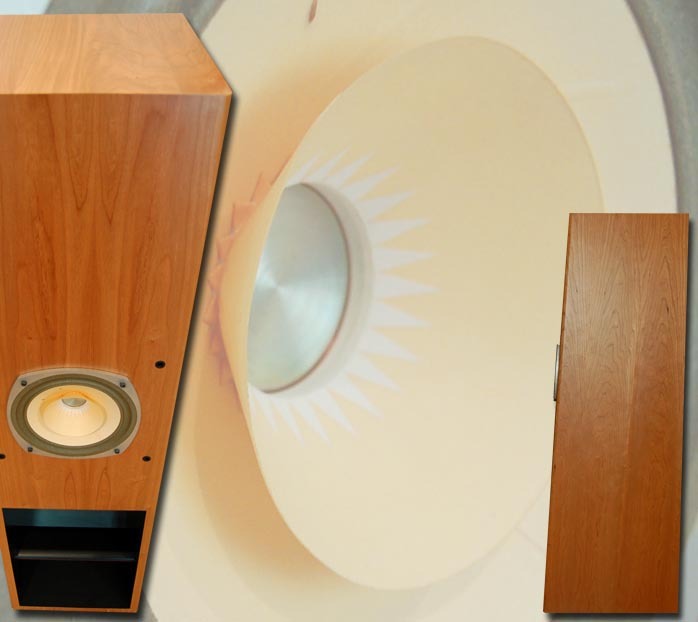 But in my experience, precious few speakers can match the Lamhorn at what it does best. I've seen the speakers quoted as being anywhere between 99dB and 104dB efficient. I don't know exactly where they stand except that anywhere between those figures makes them extremely efficient and compatible with an incredible array of amplifiers. In terms of power, the 16-watt Cyber 211s were almost overkill as was my equally rated Art Audio Carissa stereo amp. But sonically both mated extremely well. 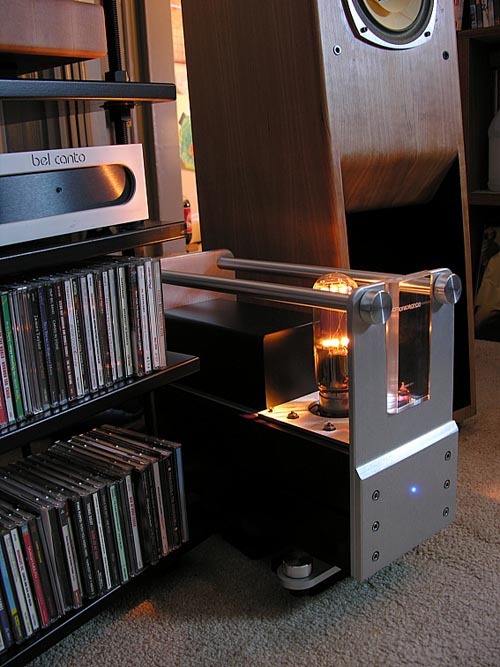 I just received the wonderful Bel Canto DAC3 (follow-up review to come), which I set to variable output and connected directly to my 500-watt Bel Canto Design e.One Ref 1000s via their balanced inputs. While the sound was certainly different than over the tube amps, the Bel Cantos sounded terrific with the Lamhorns. These speakers allowed me to hear exactly what the Bel Cantos do so well. Of course, some amps will sound better than others. The Lamhorns' resolution is such that you're going to hear exactly what your upstream electronics are doing. But bring your solid state, your push-pull, your integrateds, your flea-powered SETs, your OTLs and your chip amps and these speakers will take on most comers. The Lamhorns provide no grunt in the bass. They won't flex your walls and you won't feel it in your chest. But boy oh boy do they blend with even an inexpensive subwoofer. Don't get me wrong, many will be satisfied with the Lamhorns on their own. The music is mostly there. Cellos? Electric bass? Double bass? It's all presented but there's nothing in the way of subterranean bass kick. 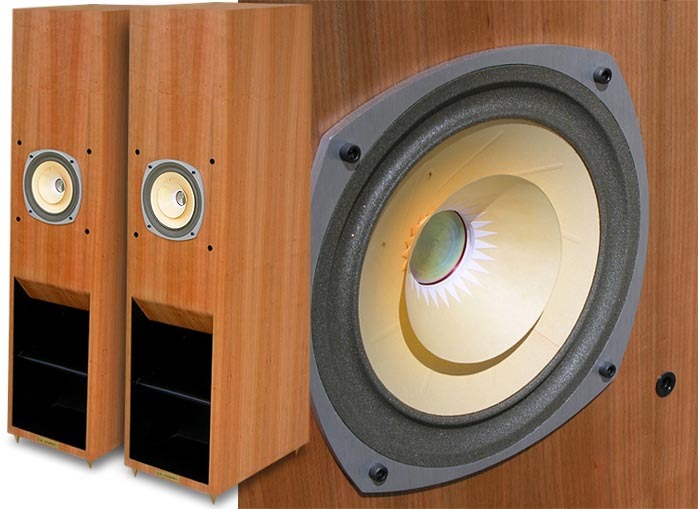 Yet add something like the inexpensive Gallo TR1 subwoofer and stand back. Don't listen to those who complain about mating a subwoofer with drivers of the AER's incredible speed. It can be done. Probably easier with a smaller rather than larger sub, too. And what about the Lamhorn's midrange? It's all you'd expect from such a speaker. And less. Much less. And in the case of the Lamhorn, less is so much more. If you haven't heard the Lamhorn, you've probably never heard the AER driver either. But perhaps you've heard a Lowther-based speaker. If you haven't heard a Lowther, you should. It may or may not be your cuppa Java but everyone should hear what they do so well. There's little in the world of speakers to compare to the intimacy and immediacy of a Lowther. It's as close to nothing between you and the music as you're likely to find. Some electrostatics may compare. But they can't compete where efficiency and sensitivity are concerned. Plus, there's much less concern about that narrow sweet spot. That's not to say Lowthers are perfect. Many of them do suffer the infamous Lowther shout. It's a peak in the upper midrange that, with the wrong choice of music, can make the speakers rough and aggressive. For many listeners, it's the fly in the ointment, the one fatal flaw. But you need to hear it anyway. And you need to hear the AER driver too simply because it doesn't suffer that fatal flow. I'm not saying that it's more acceptable than the Lowther, or that it doesn't bother me as much. I'm saying there's no shout or glare at all. It just doesn't exist. You get the speed, the microdynamics, the intimacy and the complete lack of coloration without any downsides save for that missing low bass. also free of that Lowther shout to reward with one of the most transparent, intimate and immediate midrange presentations around. But where the Lamhorn and the Hørnings part company is in the way they energize the room. With their rear-mounted woofers, down-firing horn and aftern venting system, the Hørnings saturate the front of your room with energy and provide an extremely well defined soundstage with solid and stable images. On the other hand, the Lamhorns cast their energy forward into the room to energize the entire room. 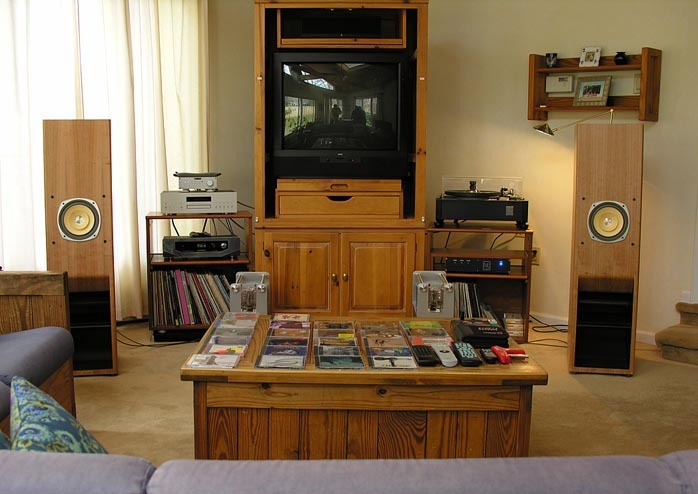 One guest in my listening room, a complete novice, was immediately moved to comment, "Who needs surround?" He'd instinctively put his finger on what I think is so special about these speakers - the way they surround and engulf the listener as they saturate the room with sound and energy. It's intoxicating. It's involving. As I said before, it's exciting. 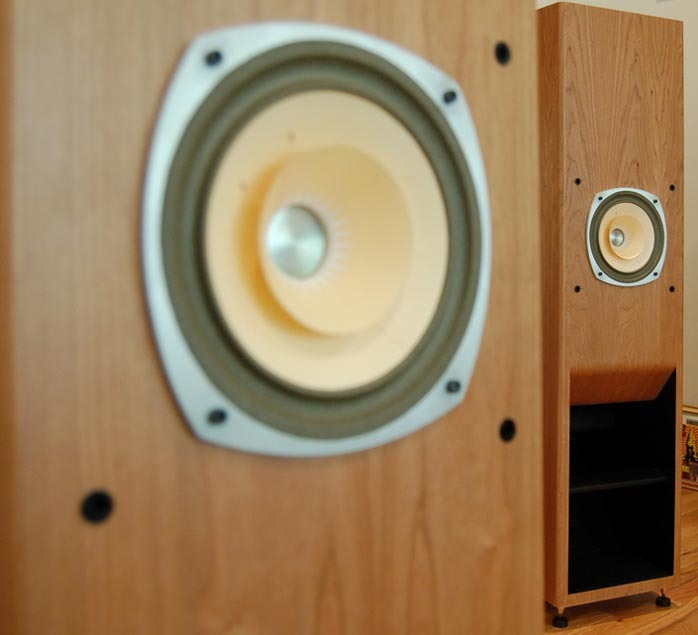 If you get a chance to hear the Lamhorn 1.8s, don't pass it up. But do ignore the one thing that the speaker doesn't do (deep bass) and listen for what this speaker does so extremely well. You can always add bass later. The total price will still be a relative bargain for the sound you'll get. And that brings me to the Chinese Cyber 211 monos from Opera, which just happen to be a superb match for these wonderful speakers. Physically, I have to say that I'm quite fond of the amplifiers' aesthetic. I like their vertical orientation. It allows floor placement without sacrificing much space. And space in a good equipment rack is expensive! I was able to situate them atop a bed of 6 Gingko Mini Clouds where they remained quite stable as well as isolated from floor vibrations. Including the outrigger feet, the Cyber 211s stand about 12 inches wide by just short of 14 inches tall and 18 inches deep. The manual claims each packed amp to weigh 30kg or 66lbs and I judge the unpacked amplifiers to weigh in at about 40 or 45 pounds. Opera specs a frequency response of 5Hz - 47kHz (-3dB), an input sensitivity of 0.6V, an input impedance of 100k ohms and a signal-to-noise ratio of 90dB. Fit and finish of the 211s are top notch. 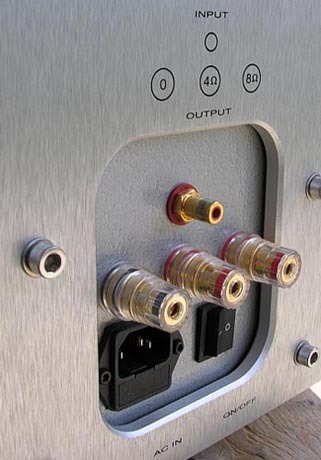 Aside from a few sharp corners on the brushed aluminum plate on top of the amplifiers through which the tubes emerge (which shouldn't really be a problem), the Cyber amps show real attention to detail and should evince great pride of ownership. I quite like the nicely finished wooden side panels but I am admittedly a sucker for the way Opera adorns much of their line in richly finished woods. It's a nice and warm contrast to all that brushed aluminum and polished stainless. Each Cyber 211 comes decked out with a JJ E88CC input tube, a Phillips 5687 driver and a Chinese Shuguang 211 power triode. The Cyber amps feature an easy-to-access bias pot (the tubes are biased to 4.8V) and a hum potentiometer should your speaker/amplifier interface betray a degree of hum which mine did not. In fact, the very first aspect of the 211s' performance I noticed was their utter silence. Upon turn-on, there's a small amount of tube rush at the speakers which quickly dissipates to complete silence even into the extreme sensitivity of the Lamhorns, quite a feat. There was zero transformer hum, no turn-on thumps either. Heat is what you'd expect from a 211 tube, naturally - which is to say, you'll appreciate these monos on a cold winter day yet they won't annoy too much in the summer. In other words, this is a very easy-to-live-with pair of amplifiers. Most other aspects of their musical personality will take some listening to discern. Comparisons to other fine amplifiers, including my own, proved the Cyber 211s to be commendably linear and neutral particularly from the midrange skyward. With both the Hørnings and the Lamhorns, I was taken with the silken treble presentation that seemed as though it was designed specifically for these speakers despite their diverging designs. 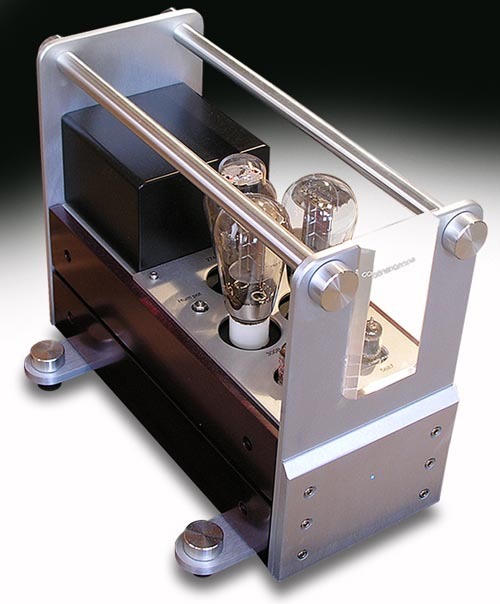 My brief detour to the Bel Canto Ref 1000 monos threw into sharp relief that these are indeed tube amplifiers. The 211s possess the sweet upper registers for which listeners gravitate toward valves. In absolute terms and by direct comparison, the 211s didn't have quite the extension of the Bel Cantos but didn't miss by much. The Cybers trade off just a miniscule touch of solid-state honesty for a measure of forgiveness that is so welcome on so many CDs. In short, what ain't there won't be missed and what's there is pleasurable and musically friendly in the extreme. The other thing that's missed only by direct comparison to 300B amplifiers -- Opera's or my own -- is that last iota of insightful detail. Now, I'm talking about an iota as a very small amount of detail, literally just a smidgen. It's something you'd notice switching back and forth between amps but nothing you'd pine for with the 211s. These are very clean amplifiers with low noise that need to make no apology in that regard. 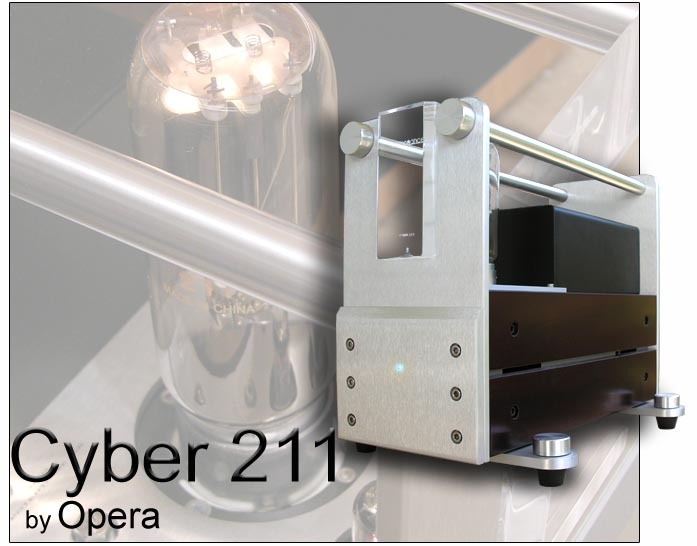 Much more incisive than most EL34 amplifiers for instance and certainly heads above the Vietnamese Navison Audio 211s I reviewed recently, the Cyber 211s are more than simply satisfactory in this regard. Where they differentiate themselves from the 300B amps is in the area of tonal and harmonic saturation. Into the kind of speaker with which the Cyber 211s excel, a 300B amp may come off as slightly cool, lean and harmonically truncated. The 300B just doesn't have this kind of meat on its bone. It won't sound as musically full and rich as a well-implemented 211. Are we talking huge differences? In no way can the answer to that question be yes. Are we talking about small yet important differences that constitute the zeroing in on true system synergies? Yes, that's exactly what we're talking about. With both my own Hørnings and the Lamhorns, I did have a preference for the 211s. Into a different kind of loudspeaker such as my Tidal Pianos where amplifier requirements diverge, there's no question that I'd go with the leaner, meaner, more incisively detailed 300Bs. Of course, the 300B PSEs' 15 watts in Opera's own stable won't do justice to the Piano's 87dB efficiency but you get my drift. I also enjoyed an opportunity to hear a pair of Opera's Cyber 300B PSE amplifiers. While in my room I ultimately favored the Cyber 211 as the more synergistic match for both the Lamhorn 1.8s and my own Hørning Perikles, I was nevertheless very impressed by several aspects of the 300B PSEs' performance. Given different circumstances such as different room acoustics or speakers of a different voicing, much of what I said about the 211s could be said about the 300Bs. With the exception of the tube complement, the two amps share the same physical features and look pretty much identical. That's a good thing. Unlike my own pair of Canary CA 330 amplifiers that use a pair of 300B tubes in push-pull, the 300B PSE utilizes a pair 300Bs in Paralleled Single-Ended mode, hence the PSE suffix. Where the push-pull configuration nets 26 watts of Canary power, the Cyber amps produce a mere 15 watts in single-ended mode and therefore are basically of the same power rating as the 16-watt 211s. There's relatively little difference there. So the main difference then is in the character of the sound produced by these two fine amplifiers running two profoundly different output tubes. Yet even that character proved surprisingly similar. Both amplifiers are essentially neutral performers of commendably low noise. When considering the high sensitivities of the speakers likely to be paired with these amps, that's a significant and important achievement. But there are differences. The 300B PSE is a more insightful amplifier. It doesn't dust the 211 but the careful listener will hear a slightly more detailed presentation. Through the midrange, the 300B PSE is slightly leaner and meaner, with a little less weight and body but a slightly greater sense of agility, speed and incisiveness. While I did prefer the Cyber 211s on the hornspeakers around here -- which are not short in any of those qualities -- on my Tidals and the Hyperion 968s, I liked the way the 300B PSE sliced through the murk a little better so to speak. Through the midrange, no conventionally configured dynamic speaker can match these single-driver horn-loaded speakers when it comes to speed and penetratingly transparent detail. No dynamic speaker I know can match their sense of immediacy and intimacy. But the 300B PSE strips away an additional veil and thus helps bridge the gap between various speaker designs. Of course, there are numerous examples of highly efficient speakers of conventional design that could also use a little more meat on their bones. The wrong amplifier will make some of these speakers sound overly thin and threadbare. If you seem to have one of these speakers, take heart that you have at least two choices from Opera - the 300B PSE and the 211 monos. Opera also makes a Cyber amp with the EL34 for 78 watts per channel. That will be a horse of a completely different color even if it shares certain Cyber similarities. From what I've been able to gather, if you're in the market, all these amps deserve consideration. Norvinz chose well to represent Opera's Cyber wares. I've probably spent too much time already talking about the Cyber 211's personality as compared to the 300 PSE amplifier (and 300Bs in general). If the relevant question is, what does the Cyber 211 sound like, the above so far has been much like answering a question with a question. But I think that the personality of the 300B tube is more widely known and understood than the 211. The point must be made that where tube amps are concerned, the 211 is much closer to the 300B than to other well-known tubes such as the KT88 or EL34. 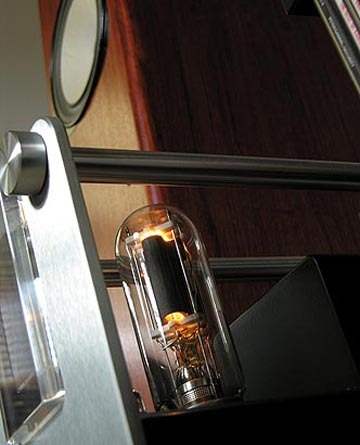 The 211 itself is a kissing cousin to the 845 tube widely regarded as a midrange lover's tube due to its immaculately transparent qualities in that range.